On a beautiful summer morning in June of 2007, I took a drive out to Libertyville, Illinois for the purpose of taking photos of the new memorial monument that had been erected and dedicated to Voyvoda Momchilo Djujich, a highly revered Chetnik commander under the command of Serbia's General Draza Mihailovich in World War II. When I arrived at St. Sava Monastery, the Serbian Orthodox Church that was home to this new memorial, I found the grounds to be even more lovely and peaceful than I had hoped they would be. The experience exceeded my expectations as the beauty of the early morning only served to enhance the serenity and nobility of this special place. There was General Draza Mihailovich, Voyvoda Pavle Djurisich, and now Voyvoda Momchilo Djujich standing guard over the church and the burial grounds of the various people for whom this was their final resting place, including King Peter II of the Karageorgevich royal family. Inside, there was the familiar gorgeous handcarved woodwork meticulously done by my Uncle many years ago. There, too, were the vivid, striking colors that make every Serbian Orthodox Church a true work of art. And there were the silent candles with their bright flames gently glowing in memorium of departed loved ones. God and his Holy Son, Jesus Christ, were omnipresent in that lovely place, and I couldn't help but feel like I was being blessed by the Holy Spirit as I enjoyed the moments of solitude and peace that being there at St. Sava Monastery afforded me on a beautiful summer morning. Below you will find a slide show that features a collection of photographs I took that morning, and I hope you will get a sense of what a special place this is. 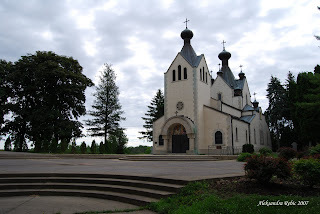 St. Sava Serbian Orthodox Monastery, Libertyville IL U.S.A. The following is found on "Flickr". The first link below will take you directly to a larger version of the same slide show of photos on "Flickr" that is featured above and the second link will allow you to look at each photo individually if you wish. Thank you, Hvala (I think). The next time I get to Chicago I will go to visit. I have read of Mihailovich's bravery and I do admire him.